Madeleine McCann: a look at the missing child in the news. With the media full of huge and often terrible stories, Madeleine McCann has been largely absent from the tabloids’ pages. But she pops up in the Daily Star. 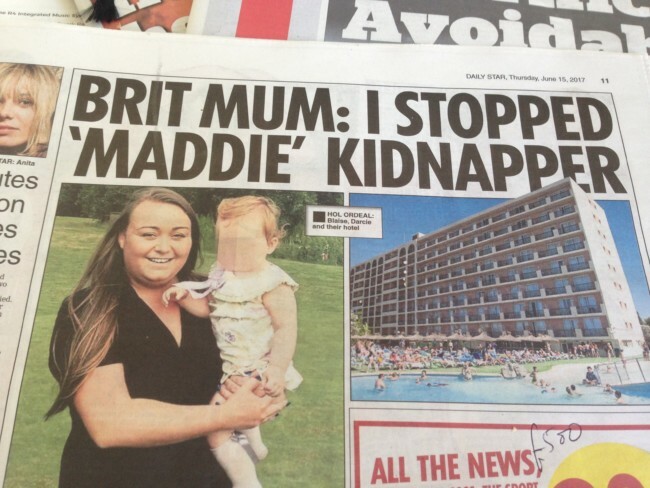 On page 11, readers are told: “BRIT MUM: I STOPPED ‘MADDIE’ KIDNAPPER.” To Mallorca, where mum Blaise Deacon says a “mystery blonde” woman “put her arms around” 23-month-old daughter Darcie and “said he was taking her”. Blaise “grabbed her child” and “refused to let go”. At which point you wonder where Madeleine McCann comes into this? She went missing in Portugal. Are we to think that anyone who took her in what some theorise to have been been a well-executed crime, is now simply grabbing kids in broad daylight on a Spanish island? The paper says this “Madeleine McCann-style kidnapper ran to a waiting car and fled”. Only, this person was not a Madeleine McCann-style anything. Moreover, Spanish police have CCTV footage of the incident, which cops investigating what happened to Madeleine McCann do not. Meanwhile, Madeleine McCann is missing. The police have nothing. But the tabloids have another sensation.